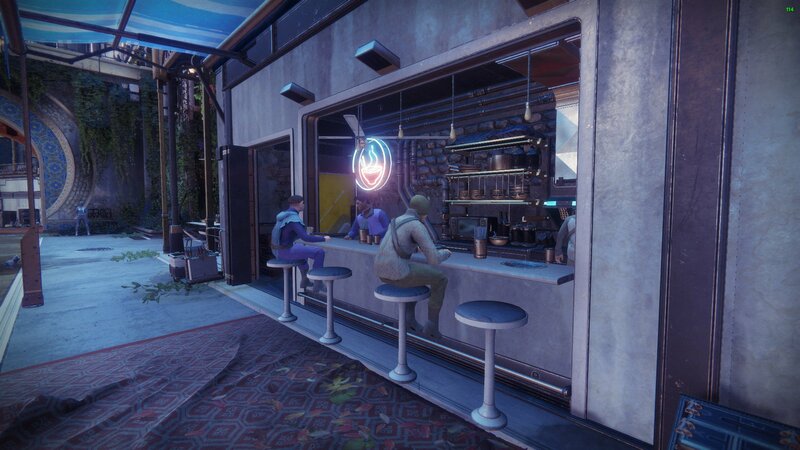 Cayde-6 is offering players some spicy ramen in Destiny 2. Destiny is well-known for including some pretty out-there challenges for players to uncover and then struggle to complete, but the spicy ramen challenge in Destiny 2 is pretty simple. Actually, it’s not so much a challenge as it is an errand Cayde-6 sends players on. Players loading into the Tower recently have noticed a little quest appearing over in the bazaar near Ikora and Hawthorne. 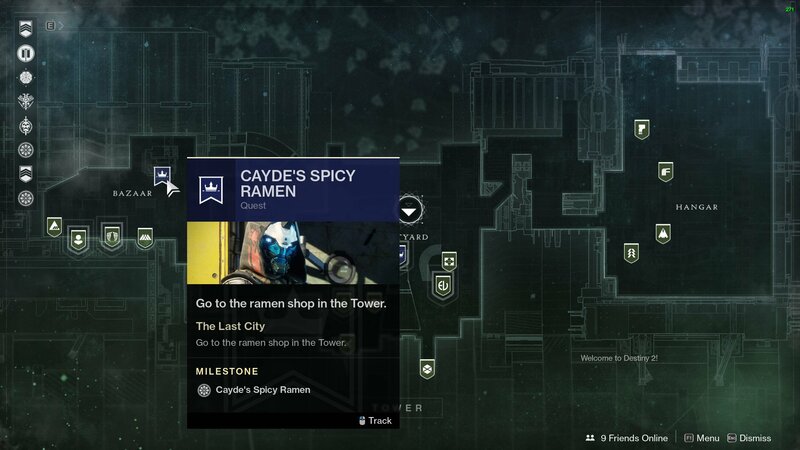 Mousing over the blue banner reveals a quest titled, Cayde’s Spicy Ramen, with a single goal: go to the ramen shop in the Tower. The ramen shop can be found – as mentioned above – in the bazaar. Head through the halls and upon entering the bazaar, look to the right to spot the ramen shop, replete with stools for customers to sit on and a neon sign in the back to remind players of the spicy ramen emote. Approach the shop and interact with it to receive an Expired Ramen Coupon. This item will appear in your inventory with the option to discard it or read its lore. The lore tab gives a little insight into the mind of Cayde-6, an avid fan of a good bowl of ramen. While players have been quick to try out ways to further this quest, according to dmg04 on Twitter, this is the end of the line for the spicy ramen quest. 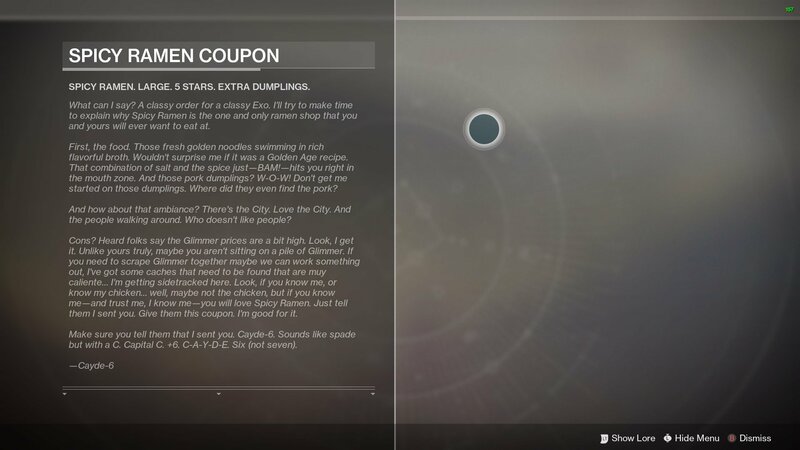 Cayde-6 has left you a coupon. It may be expired, but it’s the thought that counts. Read the lore tab on the coupon for more. There are no further steps to this quest. Nothing at reset, nothing requiring other items, keys, or activities. This is just a bit of fun to be had, which makes it all the more bittersweet given the fact that Cayde-6 is set to die in Destiny 2: Forsaken. Although, do we really think Bungie is going to kill off one of the community’s favorite characters? Swing by the Shacknews Destiny 2 Complete Strategy Guide for other helpful articles, such as raid guides and Exotic armor breakdowns!